Mohamed Salah doubled his and Liverpool’s goal tally vs Bournemouth this afternoon as the Egyptian scored a fine solo effort to give the Reds a 2-0 lead. 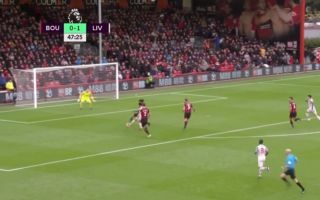 Salah, who had already opened the scoring in the first half following an effort from Roberto Firmino, latched onto a pass from the Brazilian just inside Bournemouth’s half, before taking on both Cook and Ake as he slotted home just after entering the area. The goal doubled Liverpool’s lead over the Cherries, and looks set to make sure the Reds keep up with Man City in the race for the Premier League title this weekend. Here’s the clip of Salah’s goal this afternoon. Quality run and effort from the former Chelsea man! Firmino puts Salah one on one with Nathan Ake, and it's Salah who comes out on top before slotting it into the bottom corner.